After river cruise all day long … We planned to have another river cruise in the evening. It seemed that we didn’t have enough river cruise haha!! The river cruise would be in the city, it’s called Two Rivers and Four Lakes Cruise! So we’re going to pass Li River, Taohua River, Ronghu Lake, Shahu Lake, Guihu Lake, and Mulong Lake. It’s said that Mulong Lake is the new lake. It’s been recently dug and connected with the others. We shared our plan with KFC (our tour guide), and he said that we could buy the tickets from his office. That’s nice! So we headed to KFC’s office to print the tickets. His office is actually near the Elephant Trunk Hill. 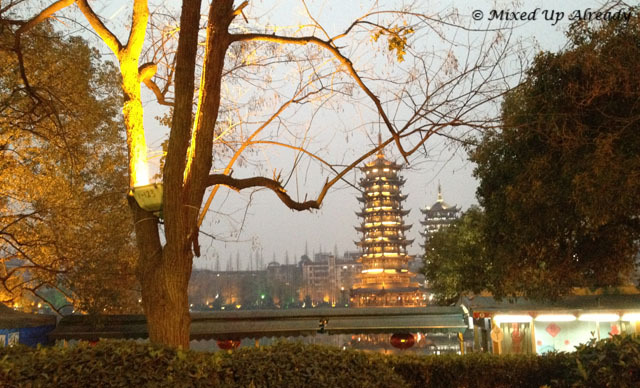 Also from the office parking space, I could see the Sun and Moon pagoda, which is located in the Ronghu Lake (or it’s also called Banyan Lake). So his office is in a great location! Lol. There were some timings for the river night cruise at night, but as we wanted to see another attraction around 8:30PM (the waterfall at the central square), so we preferred to do the river night cruise at 7:30PM. So after we got the ticket, he dropped us near the pier for the river cruise. The location is quite strategic. Nearby, I could see a big hotel, then many eating places, and also the central square. So while we’re walking alongside the river bank, we already could see the beauty of the city at night, with beautiful light on most of the buildings. Reaching the pier, apparently there’s a group of musician that played cheerful Chinese music. 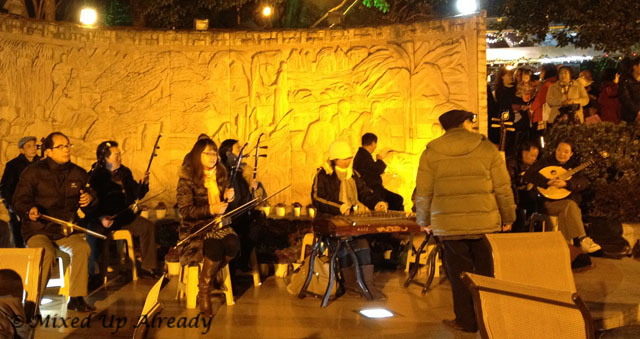 When I looked at them, I suddenly remembered The Twelve Girl Band, which is the twelve girls that play the Chinese instruments. The crowd, including myself, was enjoying the music! It’s still 8:30PM, we still had plenty of time before we headed back to the hostel … So we decided to walk around, and there’s a night market! The location was beside the hotel, so it’s in the big alley. There were plenty of things there, mostly for souvenirs. 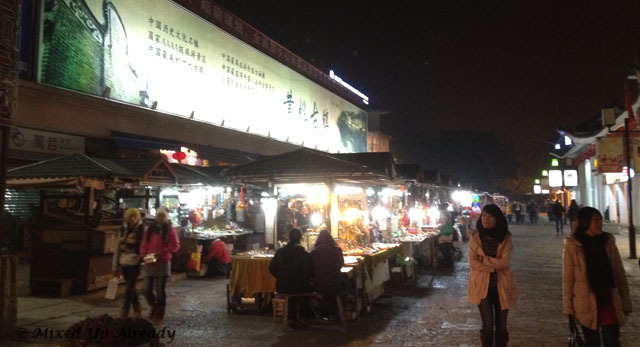 Not only the night market, there were also plenty of stores there, from clothing stores, and also café and restaurants. No need to worry if you are hungry after the river cruise. We decided to have a coffee later at night after our dinner. So we continue to walk around, and I could see the name of the street of the night market, it’s called Zhengyang Walking Street. 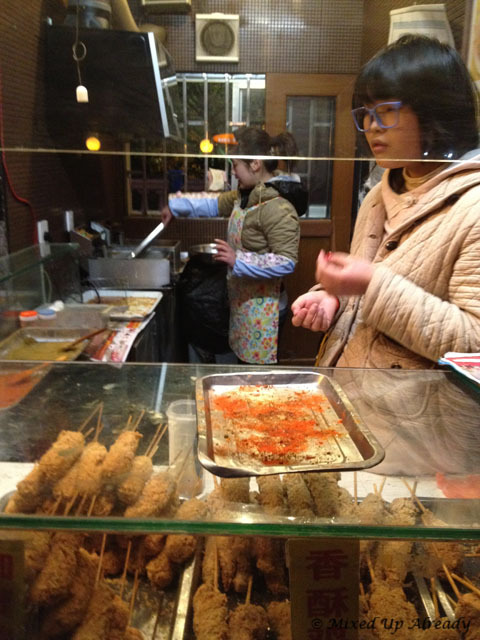 Then … In some point, we found there are many street vendors that sell light food, including the similar lamb satay that we found in Guangzhou. The seller has more variations of the satay, but all looks delicious! 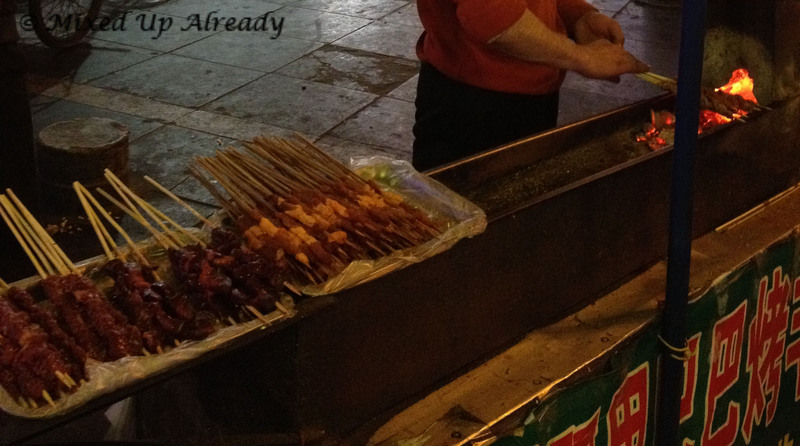 Haha … We also found quail eggs satay … Yummy yummy yummyyyyyy!!!! We discussed what we should do after the dinner … We still didn’t want to go back to the hostel yet, of course, it’s our last night in Guilin!! Arrived at the hostel, finally we went inside to our room. It’s in the first floor … And there is already guess inside. It’s a room with 4 beds. Our roommate is a Korean, named Jay. Guess what!! He travelled all the way from South Korea to China on his bike! And yes, he plans to travel around the world using his bike! This Jay is marvellous!! He shared that he put his entire bag on his bike – front, side, and back; he sometime slept in any places that he could find, and the most important things, he made friends during his journey! A lot of friend!! And he still young too … I asked for his Facebook, so I could see where he is now. (I’ve literally just checked his Facebook, and after he visited Thailand and Laos, he’s already back in China again haha. He really enjoy his time! *envy* haha).